Do you know your stalactites from your stalagmites? 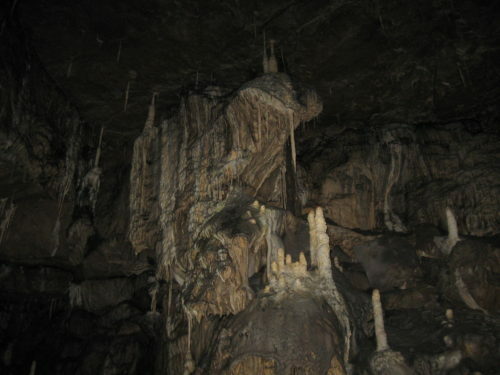 They are both formed as water drips from the ceiling of a cave, with stalactites hanging from the ceiling and stalagmites growing up from the ground. There are various different ways of remembering which is which, such as stalactites spelt with c for ceiling and stalagmites having g for ground, but if I put a photograph in sideways, could you tell which you were looking at? Water flowing through limestone carries in it the dissolved mineral calcium carbonate. 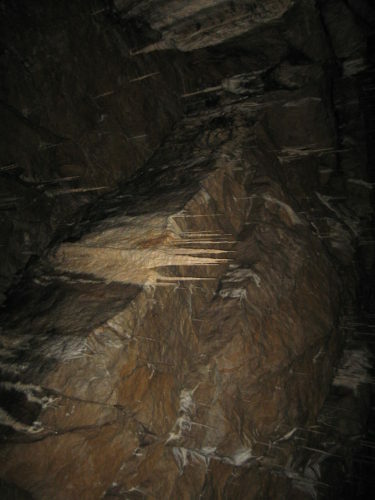 If the water trickling down through the cracks in the rock comes to the roof of a cave, it drips down and, as it does so, some of the calcium carbonate is left behind. This repeats over and over. The water drips from the point each time, until a finger of calcium carbonate hangs like an icicle from the roof. Where the drip lands, more calcium carbonate may be deposited, only this time the water is landing in a splat and the deposit can be more spread out. 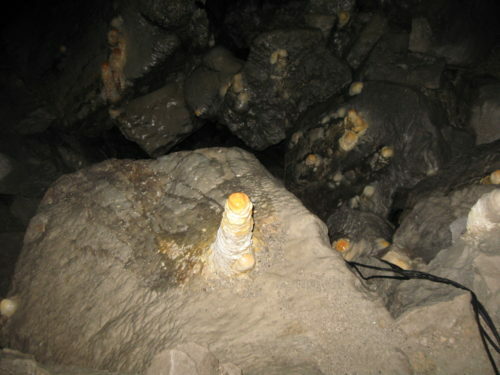 The formation is thicker forming a chunky pillar. 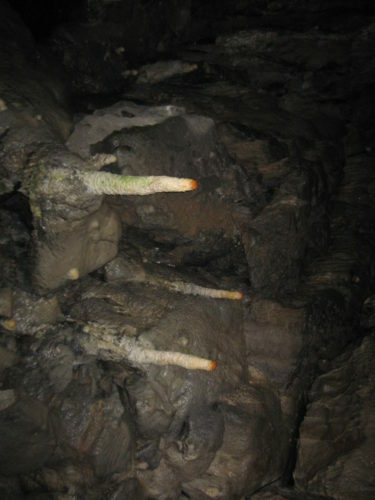 My photos are from Pooles Cavern in the Peak District, where the stalagmites look rather like poached eggs due to an unusual colouration which has not been identified. You can take a virtual tour via their website. Take yourself right to the far end of the cavern, where there is a boulder-choke blocking the route through to further caves. The boulders right next to the walkway have been cemented together by deposited calcium carbonate making a very peculiar feature. Don’t forget to look up and down as you make your way through. Use the compass to help, if you get disorientated.